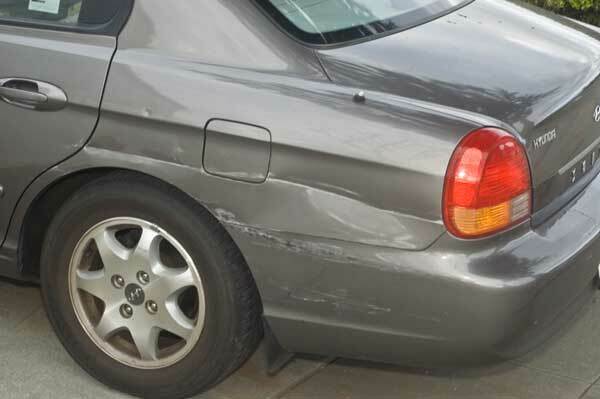 Some clod in a white contractor’s pickup sideswiped my car pulling out of the lot, then took off. I’m sure he thought “Let that guy’s inurance pay for it.” Well, I have a $500 deductible. And it’s Christmastime. No security cams on the lot, no witnesses. Great. I took it in for an estimate: $2300, 6 days’ labor. I was all ready to drop it off — I didn’t want to look at that damage even one more day — but my genius wife came up with a better idea. The rental is paid for by insurance, and we have to go to a trade show in February. And we’ll be gone about 5 days. So we’ll just drive the rental to Anaheim (~6-7 hours) and USAA can pick up the tab. Now all we have to do is figure out how to make the iPod work in the rental. We had poor success last August when we went to Art Unraveled — the Belkin FM Transmitter totally sucked, even 4 inches from the antenna. We’d drive by a semi and the signal would go all staticky. We kept having to change the station as we drove. And when the transmitter and receiver are on different frequencies, the result is a full-code-bandwidth blast of static. Can anybody recommend a better model?